When it comes to providing care for an aging or ill relative—a parent, a spouse, a friend—issues of the feet and ankle often go overlooked. Part of the reason could be simple oversight: with so many things to think about and remember, caregivers can quickly get overloaded. Sometimes, though, feet get skipped because they are unpleasant or difficult to deal with. We understand! That said, foot health is an important component of overall health and should not be ignored. At Brook Valley Podiatry, we regularly see and treat patients in their eighth, ninth, even tenth decades of life. Although we do provide regular senior foot care maintenance checkups and services, the daily and weekly attention that caregivers provide are equally, if not more important. That’s why our office is committed to supporting caregivers with the information they need to provide quality foot care for their loved one, as well as offering our professional expertise and treatment when problems cannot be addressed strictly at home. Due to limitations in eyesight, strength, or range of motion, it may be difficult for your loved one to perform their own foot inspection, so the task may fall to you. Ideally, these should be performed daily, especially if diabetes is involved. Check the entire foot carefully, including between toes, noting any changes from the last inspection or irregularities such as swelling, cuts, scrapes, cracked heels, fungal or ingrown toenails, blisters, etc. Nerve function and circulation in feet slow as a result of both aging and conditions like diabetes, so your loved one may not be able to feel when problems occur, and even minor problems are much more likely to turn into serious wounds and get infected. Inspecting feet at home at least several times a week can help you stay ahead of emerging complications and get timely treatment for them. Poor hygiene and frequent exposure to damp conditions will often lead to fungal infections such as athlete’s foot and yellowed, distorted fungal toenails. Feet should be washed daily in warm (not hot) water with mild soap, then dried thoroughly, including between toes. Once feet have dried, use a little moisturizer and put on fresh, clean, breathable socks. Do you know the right way to trim toenails? Here’s how: cut them straight across (no rounding the corners) and keep them about even with the toe tip. Doing it this way can reduce the risk of a painful ingrown toenail. We also recommend you use a big trimmer—toenails can thicken as they age, so you want a tool with enough leverage to clip the nails easily, without requiring a lot of grip pressure. The right pair of shoes is critical in preventing foot problems like bunions or hammertoes, as well as protecting senior feet from injury (especially if they have diabetes). Get your feet measured every time, even if your loved one “knows their size”—feet tend to widen with age. Comfortable, sturdy shoes that fit correctly, provide adequate cushioning and support, and are made from breathable fabrics are what you want to go with—buy two pairs so they can rotate between them every other day, allowing them to dry out between uses. if your loved one has diabetes, they should wear these shoes even when at home to protect feet from damage. We understand that different people will have different levels of mobility. That said, exercise and activity will help strengthen feet and ankles (which protects them against damage) and also improves circulation. If you can get your loved one to go for a brief walk with you, great! However, even if they’re stuck to a bed or wheelchair, you can still help them with simple stretches and seated or reclining exercises. 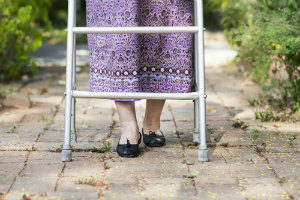 Being a caregiver for an aging parent or other relative or friend is a big task and an important one. Sometimes it can feel all-consuming, but fortunately, you are not alone. If you notice injuries or damage to your loved one’s feet, or you simply need help knowing what to do or how to better provide care, bring your loved one in to see Dr. Stuart Birnbaum at Brook Valley Podiatry. We provide comprehensive preventative and maintenance foot care to senior patients, including health screenings, nail trimming, and care, skin care, fall risk assessments, fitting for custom orthotics or diabetic shoes, neuropathy treatment, wound care, and much more. Dial (845)-352-7507 for our office in Spring Valley, NY or fill out our online form.